Around New Year’s Eve every year, I like to reflect on the highlights from the previous year in our work. For a little background, the Rights & Democracy Project (RAD) is a 501c4 member organization that was launched at the end of 2015 to build independent political power. In three short years, we have grown to a network of thousands of people including hundreds of grassroots leaders all across New Hampshire and Vermont. Our members work together to push for public policy changes and impact elections to advance rights and build a stronger democracy. We employ a full range of strategies and tactics to advance progressive change through community organizing, mass mobilization, voter engagement, legislative advocacy, direct action, leadership development including candidate training, digital outreach tools and strategic communications. We organize across a broad range of issues that impact our communities, forming coalitions with local partners, and taking action in solidarity with national and global movements. In 2018, we impacted elections up and down the ballot to transform our state legislatures and build political momentum for a populist agenda of economic, social and climate justice. The success was achieved by the work of dozens of incredibly hardworking staff and member leaders, strong support from hundreds of contributing members and volunteers, with the backing of thousands of supporters throughout our two states and beyond. It is not easy to choose, but here are are my top ten. If you’re inspired by what you read, consider becoming a member and making a donation in support of our work. Yes, I support Rights & Democracy! 10. 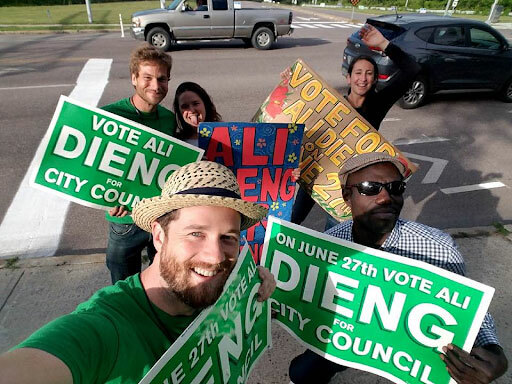 Ali Dieng Won Re-election! Ali is a founding leader of RAD and is a great example of what we call #MovementPolitics. In the Summer of 2017, Ali won a special election for Burlington City Council and then won re-election going up against a former elected City Councilor. His district is known for being one of the most conservative areas of the city and to win he has had to not only go up against some of the most powerful old guard politicians in the city (both Republicans and Democrats). Yet, he has won every race by a large margin because people know he actually listens to his community and is pushing for policies that benefit all of us. Please make a contribution at his giving page to support the organizing and the development of the next generation of leaders. 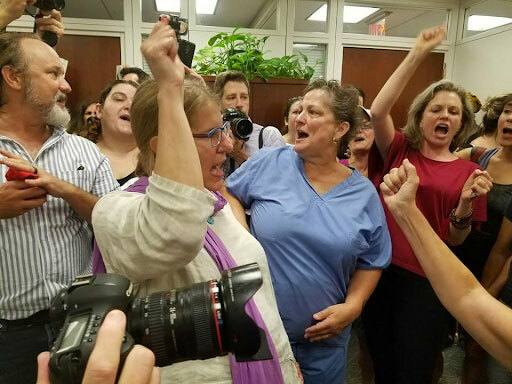 Since Trump was elected in 2016, RAD joined with our partners especially the Center for Popular Democracy, to send leaders to DC to join resistance movements to stop the attacks on the Affordable Care Act, Medicaid, Medicare, prevent the GOP billionaire tax cuts and try to prevent the Kavanaugh nomination to the Supreme Court. In a democracy, we believe that ultimately when policies threaten our our communities that exercising free speech including civil disobedience is a critical part of holding elected officials accountable. Special shout outs to Mari Cordes (more below), Vickie Lampron, Emily Ahtúnan, Kate Lapp, Mary Gerisch, Elizabeth Deutsch, Jennifer Flynn Walker and photographer T.W. Collins (check out his photos here). 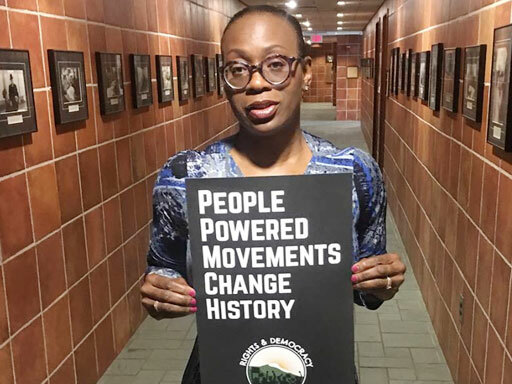 In 2018, RAD organized barnstorming people power tours with dozens of public events attracting thousands of people to join our movement with national movement leaders like Senator Nina Turner – President of Our Revolution, US Senator Bernie Sanders (I-VT) and Congresswoman Tulsi Gabbard (D-HI). This also included the #BeAHero Tour led by Ady Barkan and his organizing peers Ana Maria Archila, Tracey Corder and Jennifer Flynn Walker. These tours not only helped us build significant momentum for the 2018 Midterm Election but were the entry point for many new RAD members who are now helping us build and strengthen local organizing chapters. 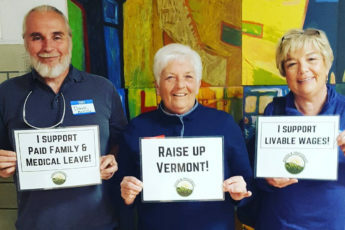 After years of organizing and working with our partners in 2018 we were able to pass paid family leave and a $15/hour minimum wage bill in Vermont through both chambers of the Vermont Legislature. 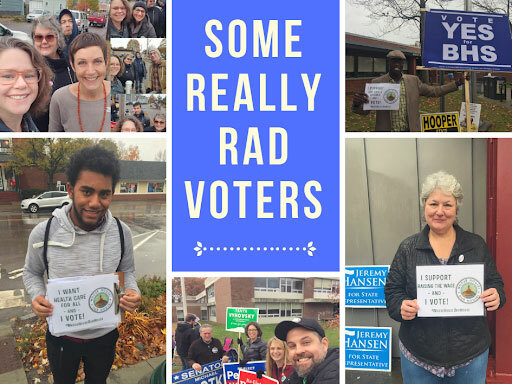 RAD helped thousands of Vermonters make their voices heard about the need to raise up the working and living conditions for working families. While Governor Scott would go on to veto these bills, this effort helped create a political mandate in the 2018 election setting the stage for a veto proof legislature to be elected. 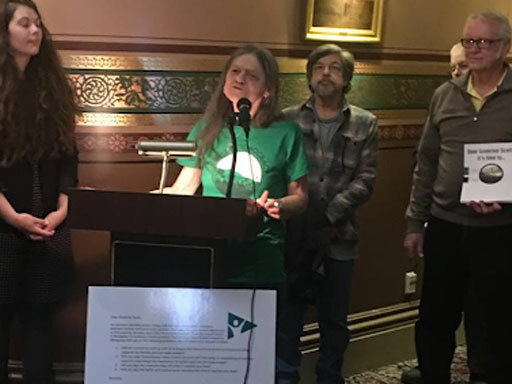 Pictured here include RAD VT leaders Elise Greaves, Mary Gerisch and Kevin Kirkpatrick at State House press conference with our partners Vermont Interfaith Action. After the 2016 election when Republicans seized power at the state level in New Hampshire, social movements were put in the defensive.. After narrowly preventing Right To Work in 2017, RAD’s big defensive fight with our partners was to stop a radical school voucher bill that would undermine public education. RAD Champion Vermont Lt. Governor David Zuckerman (Progressive/Democrat) retained his seat despite being outspent by the Republicans 3-to-1. We also defended a leading progressive voice for re-election, Executive Councilor Andru Volinksky. We have seen too many politicians get elected who do so to build only their own power and advance their career. We need more candidates like David and Andru who understand the importance of grassroots movements and actively work to help build them. Highlighted by RAD core leaders Mari Cordes and Emilie Kornheiser we saw a number of key victories down ballot in 2018. Our collaborative candidate training program LEAD Vermont trained 32 people including 5 people who won: Zach Ralph, and four who flipped Republican House seats—Mari, Kathleen James, Charen Fegard, and Scott Campbell. More than a half dozen of these trainees ran for the first time. 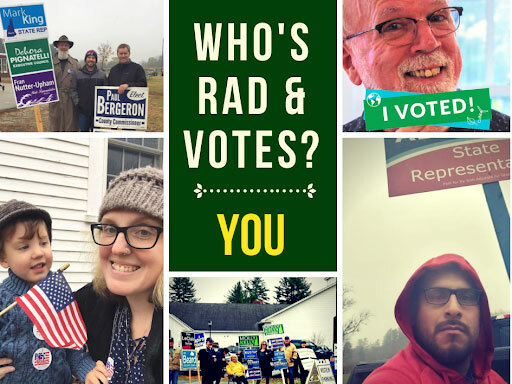 In New Hampshire, RAD members like Mark King, Jan Schmidt and Gerri Cannon won their seats and will represent our movements in the State House. In both states while the Presidential race will be getting all the attention, we will be looking to further train and recruit candidates down ballot for city council, select board and school board races in 2019 and beyond. Winning a veto-proof majority in the House means that we’ve shifted the balance of power in our state from a pen back to the people. We have paved the way to pass bold legislation like a $15 an hour minimum wage and paid family and medical leave. And we’ve increased the chances for success on legislation that tackles systemic racism, and takes real action on climate change—issues that already enjoy support by the majority of Vermonters. Our top goal of building a veto-proof VT Legislature was achieved when 12 seats were flipped in the House to win a Democrat-Progressive majority in the Vermont House. A highlight here was in the New North End of Burlington, where despite political pundits saying it was impossible, RAD leaders like Perri Freeman led dozens of volunteers to do a mass voter engagement effort that unseated longtime Republican incumbent Kurt Wright electing Bob Hooper, former president of the state employees union. Democrats and Progressives now hold 102 seats in the House out of 150. It takes 100 votes to override a veto. 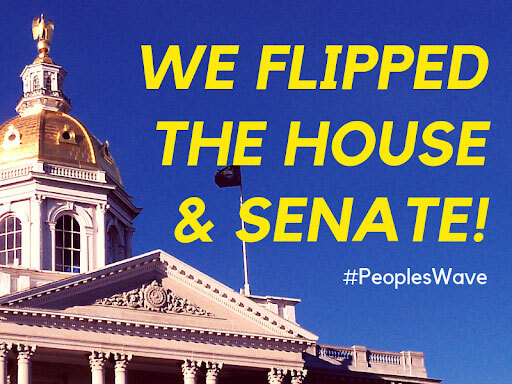 We expanded a veto-proof majority in the Vermont Senate by flipping a seat in Rutland County. Democrats and Progressives hold 24 of 30 seats in this chamber. Flipped House, Senate and Executive Council, Chris Pappas won the CD-1 seat and Annie Kuster retained the CD-2 seat as part of all of New England now sending Democrats to Congress. Pappas is the first openly gay candidate to win and serve in Congress from New Hampshire. We played a key role supporting and leading a massive field outreach effort as part a coordinated effort with our partners with Win Together. We were told that it may be possible to win back the House, but the Senate and Executive Council were likely impossible. Thank you to all our partners and supporters for helping make the impossible happen. Most importantly, RAD harvested lessons to develop our people power organizing model to expand our network in 2019, arguably the most important election year in human history. We need to be building strong statewide organization as we get ready to for the 2020 Election with the first in the nation primary in New Hampshire and opportunities to elect new Governors in each state. Building a stronger democracy is not a race, but an ongoing process and we need to grow deep roots through organizing chapters across our states to be able to be ready for the battles to come next year and in the decades ahead. THANK YOU! Bring it on 2019. 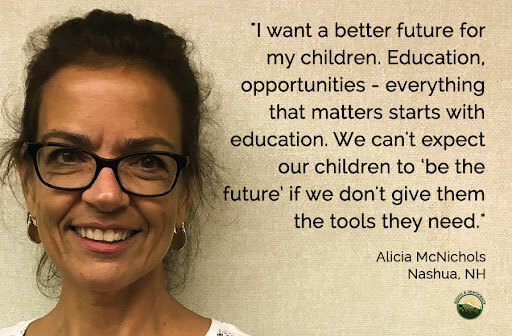 Note: If you would like to make a tax-deductible gift to our sibling organization the Rights & Democracy Education Fund you can do so by clicking here.